What doesn't kill you makes you stronger!! There are uphill climbs and then there is the mother of all uphills. That's what we started with this morning. Rocky and steep and wet; first time we have had to start out with our rain gear on. After this first brutal climb through the woods, we spiralled up the mountain on a wide forest track for about 15 kms, again constantly climbing, and then a couple hours going through a chestnut forest before finally several kms down a narrow precarious path of rock, slate and skee. The possibilities for magnificent views were there but not with today's fog, mist and rain. And true to that expression 'live and never learn', I kept my camera case hanging from my backpack belt all day...in the rain. Surprise, it got wet and quit working. Hopefully, it will be happy and functioning once it dries out. All in all a tough day, just like all the rest. 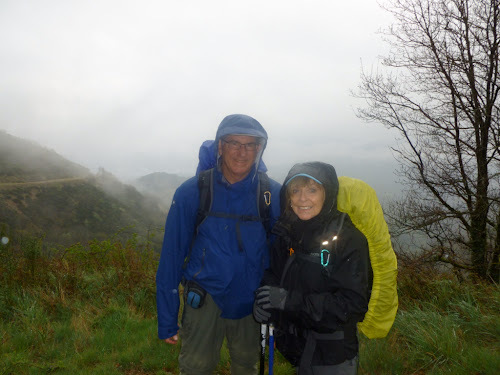 We didn't take breaks today because it was too wet to stop and too much of a hassle to get anything out of our rain covered and rain soaked packs. We certainly had some healthy nourishment options; ham and cheese baquette sandwiches, protein bars, bananas and apples but we just relied on some gummy bears for energy. Julia was leaving us in Saint Gervais du Mare to go back to Montpelier and she was eager to get there in time to hitchhike to a bigger city where she could get a bus home. Our French companion, Bruno, said that young girls have no trouble hitching rides in France and, after a quick farewell drink at the bar, which Bruno treated us all to, Dayton walked Julia out to where she was to try for a ride and true to Bruno's prediction the very first car which drove by stopped to offer her a ride. Four seconds max. Our gîte in Saint Martin sur Mare is a little sketchy. Any place where the proprietor greets you with a half smoked rolled cigarette dangling from his mouth, wearing a worn lumberjack shirt and who has no teeth is always suspect to me. Actually he does have some teeth, one is sticking straight out if his mouth and then there a few black rotten ones. And he is making our dinner tonight! I am somewhat comforted by the fact that the British couple are sharing this gîte experience with us and they certainly added to the dinner conversation. Dinner was simple fare with a flashes of some good flavours. The starter was an aperitif which was well appreciated and entusiastically consumed by especiallythe British walkers. This was followed by a very lovely leek and potato soup. The main course was a little less impressive but it still satisfied hungry pilgrims, especially if you weren't vegetarian. It was fried sausage links with pan drippings gravy and crudely mashed potatoes. Only on a pilgrim walk would I ever appreciate mashed potatoes. The dinner conversation was lively and exhausting for those who struggle to understand the language. I have yet to meet an English person who does not have a keen sense and knowledge of history and our hostess is a retired history teacher so the discussion centred on the history if the region, the various religious upheavals from the days of the Crusades on and about how this town of Saint Gervais sur Mare has the distinction of having the longest strike, a mining strike, in the history of France. That is really I preside considering France is noted for its strikes. Another part of the talk was about the religious population of the area including the prevalence of Muslims in the area. Apparently many Algerian soldiers fought alongside the French during the last World Wars and afterwards brought their families here. some of these Mulim Algerian women were expert tapestry weavers and there are still a very few who have carried these skills to today. They make tapestries for the French government who use them as gifts for foreign dignitaries, the last gift going to the King of Denmark. At least those are the stories I got out of the evening before I retired with a headache from thinking too much. Who knows; they could have been sharing recipes for all I know. Our British lady is quite interesting. She is quite self-effacing but actually quite accomplished. Effie Romain is an artist from Bristol who has also published a couple of best selling books: Creative Container Gardening and Herbal Remedies in a Pot. Even though she claimed not to be able to speak French, she certainly understood it and, with her knowledge of history, was able to contribute really well to the dinner conversation. Dayton and I were little quieter, working on our listening skills. Tomorrow, Dayton has planned a 31km killer day. I think it is rated off the difficulty scale. ane rain is forecast until the middle of next week. Oh my.